MYSORE: An explosive detection dog died on Monday, following prolonged illness. Aadi, the police dog aged 6 years, breathed his last while he was being taken to Veterinary hospital on Dhavanthri Road. The dog fell ill a fortnight ago and was under treatment. But he showed no signs of recovery, the police said. Aadi, a black Labrador, was included in the city police dog squad six months ago. Previously he had served in Bangalore for nearly six years before relocating to Mysore. The city police had utilized his services during Dasara 2010 edition to ensure peaceful celebrations. Untimely death of Aadi has created a vacuum in the city police force as at present, there is no explosive detection dog. Two ED dogs have gone for training in Bangalore and will be back only after three months. Now city police had to depend on district police in case of emergency. stop charging residents for letting pets use building elevators. Mahim society asked to stop charging residents for letting pets use building elevators. Consumer forum says if milkmen can use it, so can dogs. The status of dogs in housing societies have been elevated. 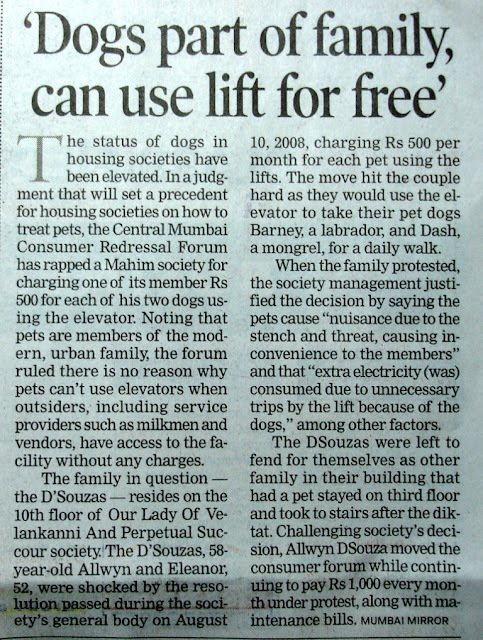 In a judgment that will set a precedent for housing societies on how to treat pets, the Central Mumbai Consumer Redressal Forum has rapped a Mahim society for charging one of its member Rs 500 for each of his two dogs using the elevator. Noting that pets are members of the modern, urban family, the forum ruled there is no reason why pets can't use elevators when outsiders, including service providers such as milkmen and vendors, have access to the facility without any charges. The family in question -- the D'Souzas -- resides on the 10th floor of Our Lady Of Velankanni And Perpetual Succour society. 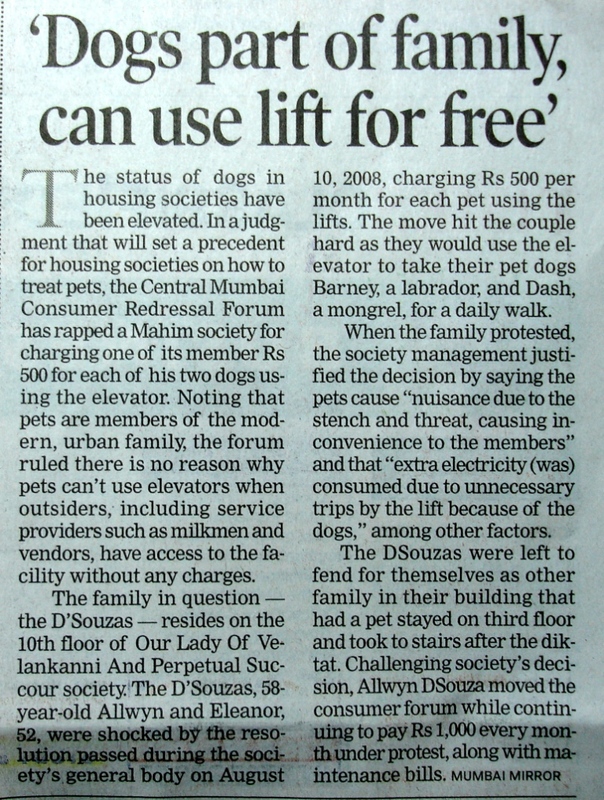 The D'Souzas, 58-year-old Allwyn and Eleanor, 52, were shocked by the resolution passed during the society's general body on August 10, 2008, charging Rs 500 per month for each pet using the lifts. The move hit the couple hard as they would use the elevator to take their pet dogs Barney, a labrador, and Dash, a mongrel, for a daily walk. When the family protested, the society management justified the decision by saying the pets cause "nuisance due to the stench and threat, causing inconvenience to the members" and that "extra electricity (was) consumed due to unnecessary trips by the lift because of the dogs," among other factors. The D’Souzas were left to fend for themselves as the other family in their building that had a pet stayed on the third floor and took to stairs after the diktat. Challenging the society’s decision, Allwyn D’Souza moved the consumer forum while continuing to pay Rs 1,000 every month “under protest”, along with maintenance bills. D’Souza’s lawyers Udav Wavikar and Rashmi Manne contended before the forum that pets are pampered and loved as much as any other family member, and hence, should be considered part of the family. Invoking religion and mythology, the lawyers said a dog is considered an incarnation of a deity in Maharashtrian culture. The lawyers further argued that forcing dogs up and down 10 floors amounts to sheer cruelty. To bolster his case, Allwyn collected signatures of society residents to attest that they had no complaints against his dogs. The society, however, said the dogs dirtied lifts by either urinating in them or soiling them, and there was the danger of them biting other residents. The society also argued that dogs are not members of the D’Souza family, and the Maharashtra Co-operative Societies Act doesn’t include them in the bracket of family members. It claimed the forum had no jurisdiction to hear the complaint. The forum noted that no resident had ever taken any objection to D’Souzas’ pets. “In a populous city like Mumbai, there is always a shortage of space and multi-storeyed buildings are fast filling up the landscape. Several outsiders such as milkmen, newspaper and vegetable vendors, laundrymen, sweepers, etc, use the building lifts on a daily basis. In such a scenario, the society’s decision to levy charges on residents’ pets for lifts usage is inappropriate,” the forum held. While Dash died last year, Barney can now use the lift without burning a hole in his owner’s pocket. பல்லாவரத்தில் கல்குவாரி குட்டையில் கழிவு நீர் கலந்ததால் குட்டையில் இருந்த ஆயிரக்கணக்காள மீன்கள் செத்து மிதக்கின்றன. சென்னையை அடுத்த பல்லாவரம் நகராட்சி 12-வது வார்டு அருகே கச்சேரிமலையில் கல்குவாரி உள்ளது. இந்த கல்குவாரி குட்டையில் மழைநீர் தேங்கியுள்ளது. இந்த குட்டையில் கோடை காலத்திலும் தண்ணீர் வற்றாது என்பதால் அந்த பகுதி பொதுமக்கள் துணி துவைக்க இந்த குட்டையை பயன்படுத்தி வந்தனர். இந்த குட்டையில் எப்போதும் தண்ணீர் இருப்பதால் பல்லாயிரக்கணக்கான மீன்கள் இதில் உயிர் வாழ்ந்து வந்தன. இந்தநிலையில் குட்டையை சுற்றியுள்ள வீடுகளில் இருந்து வெளியேறும் கழிவு நீர் இந்த குட்டையில் கலந்ததால் குட்டையில் உள்ள ஆயிரக்கணக்கான மீன்கள் நேற்று காலை செத்து மிதந்தன. இதனால் அப்பகுதியில் துர்நாற்றம் வீசியது. இதனைத்தொடர்ந்து பல்லாவரம் நகராட்சி சுகாதாரத்துறையினர் குட்டையில் செத்து மிதந்த மீன்களை அகற்றினர். குட்டையில் கழிவு நீர் கலப்பதை தடுக்க நடவடிக்கை எடுக்க வேண்டும் என அப்பகுதி மக்கள் கோரிக்கை விடுத்துள்ளனர். ஈரோடு மாவட்ட வனப்பகுதிகளில் 31 பாம்புகளை பிடித்து பதுக்கி வைத்திருந்த 3 பேரை வனத்துறையினர் கைது செய்தனர். ஈரோடு மாவட்டம் முழுவதும் வனப்பகுதியில் சிலர் பாம்புகளை பிடித்து பதுக்கி வைத்திருப்பதாக வனத்துறையினருக்கு ரகசிய தகவல்கள் கிடைத்தது. பாம்புகளை பிடித்து வைத்திருப்பவர்களை கைது செயயும் மண்டல வனப்பாதுகாவலர் அருண் உத்தரவிட்டார். இதைத்தொடர்ந்து பாம்புகளை பதுக்கிவைத்திருந்தவர்களை பிடிக்க வனத்துறை சார்பில் நடவடிக்கை எடுக்கப்பட்டது. மாவட்ட வனஅதிகாரி (சத்தியமங்கலம்) சதீஷ் தலைமையில் சத்தியமங்கலம் வன அதிகாரி பத்மா, மற்றும் அசோக்குமார் உள்ளிட்டோர் கொண்ட தனிப்படையினர் கோபி, சத்தியமங்கலம், மற்றும் சுற்றுப்பகுதியில் தீவிரமாக கண்காணிப்பில் ஈடுபட்டனர். அப்போது வனத்துறையினரின் சந்தேக வலையில் சிக்கிய ஈரோட்டை சேர்ந்த கபூர் (வயது 32), யுவராஜ் (27) மற்றும் கோபியை சேர்ந்த ஜெகன்குமார் (28), ஆகியோரை பிடித்து விசாரணை நடத்தினார்கள். விசாரணையில் இந்த 3 பேரும் பாம்புகளை பிடித்து விற்பனை செய்வது தெரியவந்தது. இந்த 3 பேரும் ஈரோடு மாவட்ட வனப்பகுதிகளில் இருந்து 6 மாலைப்பாம்புகள், 12 நாகப்பாம்புகள், ஒரு வில்லரணை என்ற விஷப்பாம்பு உள்பட 31 பாம்புகளை பிடித்து வைத்திருந்தது தெரியவந்தது. அவற்றை வனத்துறையினர் பறிமுதல் செய்தனர். மாலைப்பாம்பு அழிந்து வரும் உயிரின பட்டியலில் இருப்பதால் அவற்றை பிடித்து வைத்திருந்ததால் அவர்கள் 3 பேரும் வனத்துறையினரால் கைது செய்யப்பட்டனர். பறிமுதல் செய்யப்பட்ட பாம்புகளை ஈரோடு மண்டல வனப்பாதுகாவலர் அருண் முன்னிலையில் பண்ணாரி வனப்பகுதியில் விடப்பட்டது. இதுகுறித்து மண்டல வனப்பாதுகாவலர் கூறும்போது, "வன விலங்குகளை பிடித்தாலோ, அல்லது அவற்றை துன்புறுத்தினாலோ. வனவிலங்குகள் பாதுகாப்பு சட்டப்படி கடும் நடவடிக்கை எடுக்கப்படும்'' என்று கூறினார். The Supreme Court on Thursday permitted the Tamil Nadu government to allow ‘jallikattu' for five months in a year from January 15 in accordance with the law enacted by it for regulation of the event. A Bench of Justice R.V. Raveendran and Justice A.K. Patnaik in its order made it clear that the animals participating in the event were to be categorised as per the provisions of the Act. The Bench directed the District Collectors to ensure that the animals requiring participation were registered with the Animal Welfare Board., which Board should send its representative to monitor the event. Under the Act, no ‘jallikattu' would be permitted or held without the permission of the Collector and such permission should be obtained one month in advance. Further the event should be held only in notified places. Taking into consideration the Board's submission that last year 12 deaths were reported and 1,614 persons injured in the events, the Bench directed the Collectors to categorise the events into larger and smaller ones and said a larger amount should be deposited when the events were larger and where deaths had taken place in 2009. The Bench asked the State to consider the Board's suggestion for framing the rules. In its response, the State said ‘jallikattu' was an ancient, religious and sentimental cultural game that was being conducted for more than 400 years in villages during Pongal/harvestseason, temple/church festivals from January to December. However, as per the law, the event was restricted to five months from January to May. The State said at present Rs. 2 lakh was to be deposited by the organisers for the benefit of the victim, including the victim's family, in case of an accident or injury during the event. Since it was held mostly in villages as part of village festivals, the enhancement of the amount was not considered. Instead, individual or group insurance was suggested by collecting a nominal premium amount through insurance companies by organisers. The government said that a full-fledged veterinary team would be available at the venue for testing and certifying the bulls for participation in the event to provide treatment for bulls that get injured. The Act had sufficient safeguards and regulations for the orderly conduct of the event, the State said. Chennai, Nov 27 (TruthDive): In accordance with the law enacted on the regulation of event, the Supreme Court permitted the Tamil Nadu government to allow ‘jallikattu’ for five months in a year from January 15 . A Bench comprised of Justice Mr. R.V. Raveendran and Justice Mr.A.K. Patnaik made it clear in their order that the animals participating in the event were to be categorized as per the provisions of the Act. The Bench also directed the District Collectors to make sure that the animals that will be participating in Jallikattu should be registered to the Animal Welfare Board and in return the Board would send its representative to monitor over the event. The Act states that no ‘jallikattu’ would be permitted or will be carried out without the permission of the collector and such permission should be obtained one month in prior to the event and the location should also be informed to the board before hand. Considering the report submitted to the board, which stated the statistics of 12 deaths and 1,614 injuries at the event, the Bench directed the collectors to segregate the events into smaller and larger ones and also added that large amount should be deposited when the events were set large. The Bench considers the board’s suggestion for framing the rules. The State also responded stating that ‘Jallikattu’ is an ancient, religious and sentimental cultural game that had been conducted for more than 400 years in rural areas during Pongal in January and also for few church festivals from January to December. However, as per the law directs, the event was restricted to five months between January and May. The State added that at present two lakhs be deposited by the organizers for the benefit of the victims which also includes the victim’s family, in case of an accident or injury during the event. The government said that a team of veterinarians would be present at the venue for testing and certifying the bulls for participation in the event to provide treatment for bulls that gets injured. 10 ஆண்டுகளுக்கு பிறகு அபூர்வ வகை பறவையான ஹார்ன்பில் பறவைகள் தண்டேலிக்கு வந்து உள்ளன. இந்தியாவில் காணப்படும் அரிய வகை பறவைகளில் `கிரேட் இந்தியன் ஹார்ன்பில்' எனப்படும் பறவையும் ஒன்று. இந்த வகை பறவை கார்வார் மாவட்டம் தண்டேலி நகருக்கு வந்து உள்ளது. அங்குள்ள ஒரு மரக்கடைக்கு அருகில் கடந்த வாரம் 5 ஹார்ன்பில் பறவைகள் தென்பட்டு உள்ளன. அவை பழங்கள் கிடைக்குமா என்று தேடி வந்து இருக்கின்றன. கிரேட் இந்தியன் ஹார்ன்பில் பறவைகள், கூட்டத்தை பார்த்து அஞ்சக்கூடியது. அவை எப்போதும் மக்களிடம் இருந்து விலகியே இருக்கும். இவற்றில், கறுப்பு மலபார் ஹார்ன்பில், வெள்ளை மலபார் ஹார்ன்பில் என்பன உள்பட பல்வேறு வகைகள் உள்ளன. செங்கல்பட்டு : பாம்பு என்றால் படையும் நடுங்கும். ஆனால் பாரதபுரம் மக்களோ பாம்புகளைக் கண்டு பயப்படுவதில்லை. காரணம் அங்கு வசிக்கும் முத்துஷா குடும்பத்தினருக்கு பாம்புகளுடன் விளையாடுவது பொழுதுபோக்கு. செங்கல்பட்டு அடுத்த ஆலப்பாக்கம் ஊராட்சிக்குட்பட்டது பாரதபுரம் கிராமம். இங்குள்ள மக்கள் மற்ற பகுதி மக்களைப் போல் துவக்கத்தில் பாம்பு என்றால் அலறி அடித்து ஓடினர். முத்துஷா என்பவரின் வருகைக்கு பின் அவர்களுக்கு பாம்பின் மீதிருந்த பயம் மாயமானது. பாம்புகளுடன் விளையாடத் துவங்கினர். பாரதபுரம் கிராமத்தில் வசிப்பவர் முத்துஷா (50). விழுப்புரம் மாவட்டத்தை சேர்ந்தவர். இவரது மாமா பாம்புகளை வளர்த்து வந்துள்ளார். சிறு வயதிலிருந்தே பாம்புகளை பிடிப்பதில் முத்துஷாவிற்கு ஆர்வம் அதிகம். 30 ஆண்டுகளுக்கு முன்பு தொழுநோயால் பாதிக்கப்பட்டார். செங்கல்பட்டு அடுத்த திருமணியில் உள்ள மத்திய தொழுநோய் ஆராய்ச்சி மற்றும் போதனா நிலையத்திற்கு வந்தார். நீண்ட நாட்கள் சிகிச்சைப் பெற்ற பின் முழுமையாக குணமடைந்தார். அதன்பின் வீட்டிற்கு செல்லாமல் அங்கேயே தங்கி சைக்கிள் கடையை துவக்கினார். கடந்த 10 ஆண்டுகளாக மர வேலைகள் செய்யும் தொழிலை கற்றுக் கொண்டு, வீட்டிலேயே வேலை செய்து வருகிறார். இப்பகுதியில் யார் வீட்டிலாவது பாம்பு புகுந்தால் உடனே முத்து ஷாவை கூப்பிடுவர். அவரும் பாம்புகளைப் பிடித்து காட்டுப்பகுதியில் கொண்டு விடுவார். நல்ல பாம்பு, கட்டுவிரியன், கண்ணாடிவிரியன், வெள்ளை கத்திரி, ராஜநாகம், கருநாகம், கொம்பேரிமூக்கன் போன்ற விஷமுள்ள பாம்புகள், சாரை பாம்பு, கருஞ்சாரை, கோதுமை சாரை போன்ற சாதாரண பாம்புகள் என ஆயிரக்கணக்கான பாம்புகளை பிடித்துள்ளார். இவருக்கு ஜீனத் என்ற மனைவியும், நூர்முகமது, மும்தாஜ், ஜரினா, அமிர்கான், நிஷா என ஐந்து குழந்தைகள் உள்ளனர். தந்தையைப்போல் குழந்தைகளும் பாம்புகளைக் கண்டு அஞ்சாமல் பிடித்து விளையாடுகின்றனர். இதுகுறித்து முத்துஷா கூறியதாவது: சிறுவயதிலிருந்தே பாம்புகளை பிடிப்பதென்றால் எனக்கு ஆர்வம் அதிகம். அப்போதிருந்தே யார் வீட்டிலாவது பாம்பு புகுந்துவிட்டால் நானே ஓடிச் சென்று பிடிப்பேன். தொழுநோயால் பாதிக்கப்பட்டு 33 ஆண்டுகளுக்கு முன்பு இங்கு சிகிச்சைக்கு வந்தேன். சிகிச்சை முடிந்து இங்கேயே தங்கிவிட்டேன். இப்பகுதி மலைகளும், காடுகளும் நிறைந்த பகுதியாக இருப்பதால் பாம்புகள் அதிகமாக காணப்படுகிறது. அவை அருகில் உள்ள வீடுகளுக்குள் அடிக்கடி புகுந்து விடுகின்றன. உடனே என்னை அழைப்பர். நானும் விரைவாக சென்று பாம்பை பிடிப்பேன். அதற்காக அவர்கள் கொடுக்கும் பணத்தை பெற்றுக் கொள்வேன். இதுவரை 25 ஆயிரம் பாம்புகளை பிடித்துள்ளேன். ஒரு பாம்பை கூட அடித்து கொன்றது கிடையாது. பிடிக்கும் பாம்புகளை காட்டுப்பகுதிக்கு கொண்டு சென்று விட்டுவிடுவேன். பாம்புகளை பிடிக்கும்போது ஆறு முறை கடித்துள்ளன. கட்டுவிரியன் பாம்பு தவிர மற்ற பாம்புகள் கடித்துள்ளன. பாம்பு கடித்தவுடன் கட்டு கட்டி நீவி விட்டு ரத்தத்தை வெளியேற்றுவேன். பின் மருத்துவமனைக்கு சென்று டாக்டரிடம் காட்டுவேன். அவர்களும் ஊசி போட்டு ரத்தத்தை உடனே பரிசோதனை செய்வர். என் ரத்தத்தில் விஷம் இல்லை எனப் பரிசோதனை முடிவு வரும். நானும் வீட்டிற்கு திரும்பி விடுவேன். சில நேரங்களில் பெட்டில் மருத்துவமனையில் சேரும்படி சொல்வர். இதுவரை மூன்று முறை மருத்துவமனையில் சேர்ந்துள்ளேன். பாம்பு கடித்தால் பயப்படாமல் தைரியமாக இருக்க வேண்டும். அவசரப்படக்கூடாது. கட்டுபோட்டு விட்டு டாக்டரிடம் செல்லலாம். பாம்பு கடித்தால் பயத்திலேயே நிறைய பேர் இறக்கின்றனர். நல்ல பாம்புக்கு இரண்டு பற்களும், கண்ணாடி விரியன் பாம்புக்கு நான்கு பற்களும் இருக்கும். ஆனால் கட்டுவிரியன் பாம்புக்கு வாய் முழுவதும் பற்கள் இருக்கும். அந்த பாம்பு கடித்தால் உடனே இறக்க நேரிடும். என்னைப் போலவே என் குழந்தைகளும் பாம்புகளை பிடிப்பர். நாங்கள் பாம்புகள் பிடிப்பதை பார்த்து இப்பகுதி மக்கள் யாரும் பயப்படுவதில்லை. சிறுபிள்ளைகள் பொம்மைகளுடன் விளையாடுவதைப் போல் அவர்களும் பாம்புகளுடன் விளையாடுகின்றனர், என்றார். விஷமில்லாத தண்ணீர் பாம்பை கண்டாலே பயப்படும் நிலையில் அதிக விஷம் கொண்ட பாம்புகளையும் பிடித்து விளையாடுவதைக் காணும் பாரதபுரம் மக்களும் பய உணர்வின்றி பாம்புதானே என்ற மனநிலைக்கு மாறியுள்ளனர். CHENNAI: It was an unusual call at the fire control room here early on Thursday. A resident of Mehta Nagar in Aminjikarai informed the control room that some dogs were barking for hours from deep inside a well. A rescue team rushed to the spot around 6.30 a.m. and found four dogs battling for life. According to Station Fire Officer (Villivakkam) S. Wilson Rajkumar, rescuers found the dogs huddled together in the 15-foot well in the backyard of a house in Officer's Colony. “The dogs were fighting on an iron mesh covering the well. Since the mesh was weak at the centre, it gave way under pressure.” Mr. Rajkumar said fire service personnel used a rope to pull out the dogs, one after the other. “There were one female and three male dogs. It appeared that the dogs were in the water for at least four hours. They were huddled together taking support from a concrete slab on one side of the well. On seeing rescuers climb down the rope, the dogs knew help was under way and cooperated,” he said. Director-General of Police and Director, Tamil Nadu Fire and Rescue Services, R. Nataraj said fire service personnel were trained in rescuing animals in distress. “Our rescue team is trained by the Forest Department in handling animals. We are getting many calls on snakes entering houses and offices. An intensive training on snake-catching is on the anvil,” he said. பெங்களூரில் இருந்து கோவைக்கு கடத்தி வரப்பட்ட புலித்தோல்களை நேற்று வனத்துறையினர் பறிமுதல் செய்தனர். இதுதொடர்பாக மருத்துவக் கல்லூரி மாணவர்கள் உள்பட 8 பேர் கைது செய்யப்பட்டனர். கோவை அவினாசி சாலையில் ஒரு காரில் புலித்தோல்கள் கடத்தி கொண்டுவரப்படுவதாக கோவை மாவட்ட வனத்துறைக்கு தகவல் கிடைத்தது. மாவட்ட வன அதிகாரி திருநாவுக்கரசு உத்தரவின்பேரில் கோவை வனச்சரகர் சண்முக ராஜேஷ்வரன் தலைமையில் வனத்துறையினர் கருமத்தம்பட்டி அருகில் நேற்று காலை வாகன சோதனை செய்தனர். அப்போது ஒரு காரை மடக்கி பார்த்தபோது அந்த காரில் 8 பேர் இருந்தனர். அவர்கள் மீது சந்தேகம் எழுந்ததும் அந்த காரை வனத்துறையினர் சோதனை செய்தனர். காரில் ஒரு பையில் இருந்து 2 புலித்தோல்கள் இருந்தது கண்டுபிடிக்கப்பட்டது. அவற்றை வனத்துறையினர் பறிமுதல் செய்து, புலித்தோல்களை கடத்தி வந்ததாக காரில் இருந்த 8 பேரையும் கைது செய்தனர். விசாரணையில் அவர்கள் ஆந்திராவை சேர்ந்த நியாஸ் பர்கத் (வயது 24), விழுப்புரத்தை சேர்ந்த ஜோ (20), ஒரிசாவை சேர்ந்த வெங்கடரெட்டி (23), திருவண்ணாமலை, திருக்கோவிலூர் பகுதியை சேர்ந்த துரை என்கிற சபரிநாயகம் (25), தியாகராஜன் (25), அருள் என்கிற தனசேகரன் (23), சேகர் (24), கோபிநாத் (24) என்று தெரியவந்தது. இதில் நியாஸ் பர்கத், ஜோ, வெங்கடரெட்டி ஆகிய 3 பேரும் பெங்களூரில் ஒரு மருத்துவக்கல்லூரியில் படித்து வந்தவர்கள் ஆவார்கள். பெங்களூரில் இருந்து கோவைக்கு புலித்தோல்களை கடத்தி வந்து ரூ.10 லட்சத்துக்கு விற்க முயன்றதாக அவர்கள் வாக்குமூலம் அளித்து உள்ளனர். நியாஸ், ஜோ, வெங்கடரெட்டி ஆகிய 3 பேரும் பெங்களூரில் மருத்துவக் கல்லூரியில் படித்துவந்தபோது தினமும் வாக்கிங் செல்வதை வழக்கமாக கொண்டு உள்ளனர். அப்படி ஒருநாள் வாக்கிங் சென்றபோது ஒரு பாலத்தின் அருகில் கிப்ட் பேப்பர் சுற்றிய பார்சல் இருந்ததாகவும், அதனுள்ளே 2 புலித்தோல்கள் இருந்ததாக கூறி உள்ளனர். உடனே அவற்றை தங்களது அறைக்கு கொண்டு வந்து மறைத்து வைத்துக்கொண்டு, அதை விற்று பணமாக்க முயற்சித்து இருக்கிறார்கள். அதற்காக தனது நண்பர்கள் சிலரிடம் தெரிவித்து அவர்கள் சொன்ன தகவலின்பேரில் கோபிநாத்தின் நட்பு அவர்களுக்கு கிடைத்து உள்ளது. அந்த புலித்தோலை கோவை உக்கடத்தில் தனக்கு தெரிந்த ஒருவரிடம் ரூ.10 லட்சத்துக்கு விற்றுத் தருவதாக கோபிநாத் கூறி இருக்கிறார். அதையடுத்து மாணவர்கள் 3 பேரும் மற்ற 5 பேரும் கோபிநாத் காரில் கோவைக்கு வந்து கொண்டு இருந்தனர். அவர்கள் கருமத்தம்பட்டியை கடந்து வரும்போது கைது செய்யப்பட்டனர். அவர்களிடம் இருந்து கைப்பற்றப்பட்டவை உண்மையிலேயே புலித்தோல்கள்தானா? அல்லது போலியானதா? என்று கோர்ட்டு அனுமதியின்படி பரிசோதனைக்கு அனுப்பப்படும். அதை பார்க்கும்போது சில ஆண்டுகளுக்கு முன்பு இறந்த புலியில் இருந்து எடுக்கப்பட்டதுபோல் தெரிகிறது. கோவையில் புலித்தோல்களை விலைக்கு வாங்குவதற்கு தயாராக இருந்த கும்பல் யார்? என்றும் விசாரித்து வருகிறோம். அவர்களை கைது செய்யவும் தீவிர நடவடிக்கை எடுக்கப்பட்டு வருகிறது. கைதான 8 பேரும் அவினாசி மாஜிஸ்திரேட்டு கோர்ட்டில் ஆஜர்படுத்தப்பட்டு கோவை மத்திய சிறையில் அடைக்கப்பட்டனர். சென்னை மேத்தா நகர், ஆபீசர்ஸ் காலனி அருகே ஒரு பெண் நாயை விரட்டிச்சென்ற 3 ஆண் நாய்கள் ஒன்றுக்கொன்று சண்டை போட்டுக்கொண்டன. சண்டையின் உச்ச கட்டத்தில், அருகில் இருந்த பாழடைந்த கிணற்றுக்குள் பெண் நாய் விழுந்துவிட்டது. மற்ற நாய்களும் அடுத்தடுத்து கிணற்றுக்குள் விழுந்தன. தண்ணீரில் நீந்தியபடி கிணற்றுக்கு உள்ளேயும் நாய்களுக்கு இடையே சண்டை நீடித்தது. சிறிது நேரத்தில் அந்த நாய்கள் சோர்ந்து போய் உயிருக்கு போராடியபடி தத்தளித்தன. உடனே பொதுமக்கள் இதுபற்றி தீயணைக்கும் படையினருக்கு தகவல் கொடுத்தனர். தீயணைக்கும் படையினர் விரைந்து சென்று 2 மணி நேரம் போராடி உயிருக்கு போராடிய நாய்களை வலையை போட்டு மீட்டனர். ஜெய்ப்பூர்: ராஜஸ்தானில் கடும் பனிகுளிர் தாங்காமல் மாட்டுத்தொழுவத்தில் கட்டி வைக்கப்பட்டிருந்த 100 மாடுகள், கன்றுகள் இறந்து போயின.ராஜஸ்தானின் பில்வாரா மாவட்டத்தில் குலாப்பூர் கிராம் உள்ளது. இங்கு விவசாயம் மற்றும் பால் பண்ணைகளுக்காக மாட்டுத்தொழுவம் ஒன்று அமைக்கப்பட்டிருந்தது. மலைப்பகுதியை ஓட்டிய கிராமம் என்பதால் இங்கு இரவு நேரத்தில் கடும் குளரி்ர் காற்று வீசியது. குளிர் தாங்காமல் 100-க்கும் மேற்பட்ட மாடுகள் , கன்றுகள் இற்ந்து போயின். சம்பவம் குறித்து கால்நடைத்துறை அதிகாரிகள் விசாரித்து வருகின்றனர். இது குறித்து அப்பகுதி மக்கள் கூறுகையில்,மாடுகளை சரியாக பராமரிக்காமல் போனதே இறப்பிற்கு காரணம் என்றனர். மேலும் மாவட்ட வருவாய் அதிகாரி விசாரித்து இறந்த மாடுகள் பிரேத பரிசோதனைக்காக அரசு கால்நடை மருத்துவமனைக்கு அனுப்பப்பட்டுள்ளது என்றார். சத்தியமங்கலம் வனப்பகுதி கிராமங்களில் யானைகள் ஊருக்குள் வருவதை தடுக்க அகழிகள் அமைக்கும் பணியை வன அதிகாரிகள் பார்வையிட்டனர். ஈரோடு மாவட்டம் சத்தியமங்கலம் வனக்கோட்டத்தில் நடைபெற்று வரும் திட்டப் பணிகளை தலைமை வனப்பாதுகாவலர் சஞ்சய்குமார் ஸ்ரீவஸ்தவா, மற்றும் மண்டல வனப்பாதுகாவலர் து.அருண் ஆகியோர் பார்வையிட்டனர். அப்போது டி.என்.பாளையம் சரகத்திற்கு உட்பட்ட கொங்கர்பாளையம் பகுதியில் ,தனியார் நிலங்களில் மரம் வளர்த்தல் திட்டத்தின் கீழ் நடவு செய்யப்பட்டுள்ள தோட்டப் பகுதிகள் மற்றும் காட்டு யானைகள் விவசாய நிலங்களுக்குள் நுழைந்து சேதம் ஏற்படுத்துவதை தடுக்கும் பொருட்டு, யானைப்பாதுகாப்புத் திட்டத்தின் கீழ் வெட்டப்பட்ட அகழியை பார்வையிட்டு ஆய்வு செய்தனர். மேலும் தமிழ்நாடு காடு வளர்ப்புத் திட்டத்தின் கீழ் மாற்று வேலைவாய்ப்பினை உருவாக்கும் நோக்கத்தில் 9 கிராமங்களைச் சேர்ந்த பழங்குடியின 85 கிராம வனக்குழு உறுப்பினர்கள் மற்றும் 4 மகளிர் சுய உதவிக் குழுக்களுக்கு கடன் உதவி வழங்கும் நிகழ்ச்சி நடந்தது. நிகழ்ச்சியின்போது ரூ.9 லட்சத்து 69 ஆயிரத்து 800 கடன் உதவியையும் வன அதிகாரிகள் வழங்கினர். நிகழ்ச்சியில் சத்தியமங்கலம் வன மாவட்ட அதிகாரி சதீஸ், வனஅதிகாரி சி.ஹெச்.பத்மா(பயிற்சி) மற்றும் உதவி வனப்பாதுகாவலர் தூ.கோ.அசோக்குமார், (பயிற்சி) ஆகியோர் கலந்து கொண்டனர். டெல்லி: ரூ. 2 லட்சம் டெபாசிட் தொகை செலுத்த வேண்டும் என்பது உள்ளிட்ட பல்வேறு நிபந்தனைகளுடன் ஜல்லிக்கட்டு நிகழ்ச்சியை நடத்த உச்சநீதிமன்றம் அனுமதி அளித்துள்ளது. ஜல்லிக்கட்டுக்கு எதிராக விலங்குகள் நல அமைப்பு உச்சநீதிமன்றத்தில் வழக்க தொடர்ந்தது. இந்த வழக்கை நீதிபதிகள் ரவீந்திரன், பட்நாயக் ஆகியோர் அடங்கிய பெஞ்ச் விசாரித்து வந்தது. இன்று இறுதிக் கட்ட விசாரணை நடந்தது. அப்போது தமிழகஅரசின் சார்பில் ஆஜரான சொலிசிட்டர் ஜெனரல் கோபாலகிருஷ்ணன் ஆஜராகி, களமிறக்கப்படும் காளைகள் அவற்றை அடக்கும் போட்டியில் பங்கேற்கும் வீரர்கள் மற்றும் பார்வையாளர்கள் ஆகியோருக்கு உரிய பாதுகாப்புகள் செய்த பிறகே, ஜல்லிக்கட்டு நடத்தப்படுகின்றன. போட்டிகளுக்கு முன்னதாக காளைகளுக்கும், வீரர்களுக்கும் மருத்துவப் பரிசோதனை நடத்தப்படுகிறது. எனவே காளைகள் துன்புறுத்தப்படுவதாக கூறப்படுவதை ஏற்க முடியாது. கடந்த முறை தமிழகத்தில் 129 இடங்களில் நடத்தப்பட்ட ஜல்லிக்கட்டு, இந்த ஆண்டு 46 இடங்களாக குறைக்கப்பட்டுள்ளது என்றார். இதை ஏற்ற பெஞ்ச், ஜல்லிக்கட்டு நடத்த அனுமதி அளிப்பதாக உத்தரவிட்டனர். மேலும், ஏராளமான நிபந்தனைகளையும் விதித்தனர். அதன்படி, ஜனவரி முதல் மே மாதம் வரைதான் போட்டி நடத்த வேண்டும். விதிகளின்படி விண்ணப்பித்து ஜல்லிக்கட்டுகள் நடத்தப்படுவதை மாவட்ட ஆட்சியர்கள்தான் உறுதி செய்ய வேண்டும். CHENNAI: A one-year-old blue whale was washed ashore near the Chennai port on Monday. Explaining the features of the blue whale, Supraja Dharini of the TREE Foundation, who is working in the area of marine mammal conservation, said that from the mottled blue grey spots on its body it was identified as a blue whale. The throat groves, the flippers and tail fluke were all clear, which also helped in the identification. There were more than 55 ventral pleats and more below the surface of the water, which started from right under the chin and went down to the naval. The carcass measured 12.6 metres in length without the head. The average adult size is 25 meters for males and 31 meters for females. It has been studied that the calves could gain around 90 kg per day and grow to a length of around 15 metres within 6-8 months from birth. It is during this period that the calf separates from its mother so the stranded whale could be a just separated calf, she said. 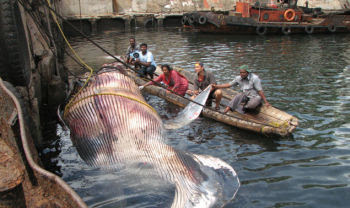 This is the second incident of a blue whale being washed ashore in the Chennai coast. On Tuesday, the whale was towed by the Chennai Port Trust authorities near the gate one area of the port which had a sandy stretch and with the help of three earthmovers the carcass was buried in a pit. பவானிசாகர் வனப்பகுதியில் ஒரு பெண் யானை இறந்து கிடந்தது. ஈரோடு மாவட்டம், பவானிசாகர் வனப்பகுதியில் தெங்குமரஹடா செல்லும் வழியில் பவானிசாகர் வன ரேஞ்சர் ராஜுமோகன் வனத்துறையினருடன் நேற்று முன்தினம் காலை ரோந்து பணியில் ஈடுபட்டார். அப்போது தெங்குமரஹடாவில் இருந்து 5 கிலோ மீட்டர் தொலைவில் காட்டுக்குள் பெண் யானை ஒன்று செத்துக்கிடந்தது. இதுகுறித்து உடனே மாவட்ட வன அதிகாரி (சத்தியமங்கலம்) சதீசுக்கு தகவல் கொடுத்தார்கள். அவருடைய உத்தரவின் பேரில் கால்நடை மருத்துவர் மனோகரன் சம்பவ இடத்திற்கு விரைந்து சென்றார். வனப்பகுதியில் செத்துக்கிடந்த யானையை கால்நடை மருத்துவர் மனோகரன் பிரேத பரிசோதனை செய்தார். அந்த யானைக்கு 36 வயது இருக்கும் என்றும், குடற்புழு நோய் தாக்கி இறந்ததாகவும் பிரேத பரிசோதனை செய்த டாக்டர் தெரிவித்தார். பின்னர் யானையின் உடல் அதே இடத்தில் புதைக்கப்பட்டது. சென்னை: வண்டலூர் உயிரியல் பூங்காவில் வெள்ளைப் புலிகள் இனப் பெருக்கத்தை அதிகரிக்க 1.50 லட்சம் மதிப்பில் 2 பெரிய கூண்டுகள் அமைக்க முடிவு செய்யப்பட்டுள்ளது. உயிரியல் பூங்கா நிர்வாக இயக்குனர் ரெட்டி நிருபர்களிடம் கூறியதாவது:வண்டலூர் உயிரியல் பூங்காவில் மொத்தம் 7 வெள்ளை புலிகள் உள்ளன. இதற்கு போதுமான கூண்டுகள் இல்லாததால் இனப்பெருக்கம் செய்வதில் சிக்கல் உள்ளது. எனவே&nbsp; 2 பெரிய கூண்டுகள் அமைக்க முடிவு செய்து டெண்டர் விடப்பட உள்ளது. மழைக்காலம் முடிந்ததும் கூண்டு அமைக்கும் பணி தொடங்கப்படும். இதுபோல சிங்கவால் குரங்கு இனப் பெருக்கத்துக்கும் கூடுதல் கூண்டுகள் அமைக்க ஏற்பாடு செய்யப்படுகிறது. கோடை காலத்தில் தண்ணீர் பற்றாக்குறையை போக்க பூங்கா வில் உள்ள குளம், கிணறுகளில் மழைநீர் சேமிப்பு வசதி செய்யப்படுகிறது. இவ்வாறு ரெட்டி கூறினார். KOCHI: The Kerala Forest Department officials have only basic expertise in criminal investigation against hi-tech wildlife offences, said a communication from senior officers that was drafted for a brainstorming session on modernisation of the Forest Department. The session was held at the Forest Headquarters on Saturday. It said expertise in criminal investigation needed to be improved considering the fact that wildlife offenders used modern methods and engaged high-tech communication gadgets. The crimes were committed in an organised manner and inter-State groups were found involved in the offence, the communication said. It said the criminal investigation wing needed to be overhauled and modern training should be imparted to the staff. It also rued the fact that there had only been a marginal increase in the number of protective staff of the Department. Many Forest staff members were unaware of the practical application and knowledge of modern technologies such as Global Positioning System, Geographical Indication System and computers. The staff also should be exposed to the branches of science like forestry research and wildlife sciences, it was pointed out. The department officials stated that Forest guards were working under tough conditions. There has also been a drain in staff strength as many guards were found opting for lower posts in other departments. Lack of proper accommodation, travel and communication facilities and other social amenities for the guards might be reasons for the staff drain. Considering the gravity of the work and the risks that the Department has to face, the shortage of protective staff was a matter of grave concern, the communication said. Currently, 2,404 guards, 859 foresters, 160 forest watchers, 138 deputy rangers and 204 range officers were serving the department to protect 1,1033.3877 sq km of forest. The department was also aware of the need to prevent separatist forces from operating from the interior forests of Kerala as has happened in North India, the department cautioned. Deliberations were held in 10 key areas, including prevention, biodiversity conservation, protection of biodiversity in non-forest areas, natural forest management and delegation of powers. Invited experts were divided into 10 groups for discussions and each group made a presentation. The recommendations of the committee appointed to give suggestions regarding the overhauling and modernisation is expected to be ready by December, officials said. GUWAHATI: The already-diminishing tiger population of India has seen a further cut with two carcasses of the big cat being found from different spots inside the Kaziranga National Park, about 250 km from here, in the past 24 hours. A highly-decomposed carcass was found near Laudubi camp under Kohra forest range of the park on Wednesday, while the carcass of a full-grown male with a deep injury mark was discovered in the Gerakati area under the Bagori forest range of the park on Thursday. The tiger that was found dead at Gerakati was estimated to be around five years old. Officials from National Tiger Conservation Authority (NTCA), the apex tiger conservation body, rushed to the park to investigate the deaths of the big cats. Although the post-mortem reports are yet to come, officials from NTCA ruled out any poaching angle in the tiger deaths. "We don't think the tiger deaths are related to poaching. Preliminary investigation has revealed that the causes of both the deaths were natural. The injury mark in the second tiger's body could have been inflicted by the horn of a wild buffalo. These buffaloes often defend themselves from tiger attacks by rushing at them with their long and pointed horns," an NTCA official said. Kaziranga divisional forest officer D D Gogoi said all the body parts of the two tigers were found to be intact and the post-mortems were conducted in the presence of officials from NTCA, WWF-India and other NGOs along with park officials. "There was no involvement of poachers in the two tiger deaths," Gogoi claimed. With this, the tiger casualty toll has increased to four this year in Kaziranga. In February 20, 2010, a decomposed tiger carcass was found in the park. Between November 2008 and September 19, 2009, a total of 12 tigers died in Kaziranga. AJMER: Standing tall at 68 inches, the two-and-half year old filly from Punjab, "Sundri" received the highest bid of Rs 51 lakh at the international cattle fair in Pushkar. The proud owner, however, wasn't too happy with the bidding amount, and was expecting to fetch nothing less than a crore for her. "Sundri is taller compared to her age. She is a well-built young member of the Khatiyawadi breed, and is expected to remain in demand," said the owner Sukhdeep, who chose not to sell the female horse. So it was another filly called Kajal traded for Rs 1.6 lakh that recorded the highest transaction at the fair. Till Sunday, the combined cattle sale registered at the fair is estimated at Rs 7.3 crore, much higher than previous year. Though Kajal was not among the highest-rated animals, she managed to fetch a price way ahead of the highest bid of Rs 1.11 lakh recorded last year. "Kajal belongs to the Nagauri breed, and could be fairly priced up to Rs 3 lakh. However, the buyer was able to negotiate and secure the deal for around half the price," said Pokaram, who sold his filly to a buyer from Hissar, Haryana. Pride and family status govern cattle buying activity at the fair. Most buyers came from Haryana, Uttar Pradesh and Punjab. Local farmers were interested in purchasing camel and cows ahead of the harvest season. "Because of good monsoon, I wanted to plough more area in my field and therefore, purchased three camels," said Rattan Vashnav from Jodhpur. According to the husbandry department, till Sunday nearlt 3,352 cows, 472 buffalos, 9,419 camels and 5,339 horses were sold in the fair. The department earned another Rs 42 lakh from the sales of sugarcanes at the fair, an official said. JAIPUR: Dogs are often called Man's best friend', thanks to the animal's unflinching loyalty for their masters. There are plenty of stories how a pet dog saved his master, but in this case Jitendra Swami (45), a Jaipur-based jeweller, lost his life in a bid to save his pet, who, unfortunately also died. According to the police, Jitendra, a resident of Himmat Nagar, went for his usual morning walk on Sunday with his pet. He left his house about 8.30 am. On way the dog climbed onto a railway track. Swami, who was holding the leash, was walking besides the track. Hearing the sound of an approaching train, the dog became frighttened and ran faster pulling Swami along. The man tried to restrain the dog and tried to pull out the dog from the track but failed. Meanwhile, the train came fast and within seconds both were run over. The incident happened near Himmat Nagar Dairy plant. After the accident a large number of people gathered at the spot and Bajaj Nagar police was informed. It was a gory site as flesh was littered all over the place. ASI Kalaram, the investigating officer, said the bodies were found in a highly mutilated condition. The police sent the bodies for post-mortem. KANPUR: On Saturday morning, more than 100 dogs were well-groomed dog were pitted against each other in a dog show held at the Garrison Ground. From cute pomeranians to mighty Great Danes, canines of various breeds were vying for attention. Grabbing the eyeballs of the spectators by the fine lustrous fur or huge built, the show turned out to be quite entertaining. On display were a range of breeds such as the hounds (beagle, dachshund, greyhound and Rampurhound), the gundog (American cocker spaniel, cocker spaniel, golden retriever, labrador), the utility ones (dalmatians, French bulldog, Lhasa apso, schnauzer, shar pei, smaller German spitz), the working breeds (boxers, bull mastiff, Doberman, mastiff, Neapolitan mastiff, rottweiler) and the pastoral (German shepherd). The main attraction of the show were huge Great Danes and Saint Bernard, mainly because of size. Kids and their parents enjoyed watching the dogs. The participants were tested on beauty as well as purity of breed. Trials were conducted to judge the brain and brawn of the dogs. Dogs under the toy group like Chihuahua, miniature pincher, pomeranian, Pug and American cocker spaniel paraded before the judges. The dogs were examined by a veterinary surgeon and certified fit to participate in the show. For Rajesh Kumar, it was a proud moment when his Great Dane won the challenge certificate and became a successful contender for the champions trophy. பெங்களூரில் உணவில் விஷம் கலந்து 18 நாய்கள் கொல்லப்பட்டன. நாய்களை கொன்றவர்கள் குறித்து போலீசார் விசாரித்து வருகிறார்கள். பெங்களூர் மடிவாளா போலீஸ் சரகத்துக்கு உட்பட்ட ஜக்கசந்திரா பகுதியில் நேற்று 18 தெரு நாய்கள் மர்மமான முறையில் இறந்து கிடந்தன. இதை பார்த்து அதிர்ச்சி அடைந்த அந்த பகுதி மக்கள், உடனடியாக போலீசாருக்கு தகவல் தெரிவித்தனர். உடனே போலீசார் விரைந்து சென்று, அந்த பகுதியை சேர்ந்தவர்களிடம் விசாரணை நடத்தினர். பின்னர் மாநகராட்சி அதிகாரிகள், கால்நடை டாக்டர்கள் அங்கு வரவழைக்கப்பட்டனர். கால்நடை டாக்டர்கள், இறந்த நாய்களை பிரேத பரிசோதனை செய்தனர். பரிசோதனையில், உணவில் விஷம் கலந்து நாய்களை கொன்றது தெரியவந்தது. திருடர்கள் இந்த நாய்களை கொன்றார்களா? அல்லது நாய்களின் தொல்லை தாங்க முடியாமல் குடியிருப்புவாசிகள் கொன்றார்களா? என்பது தெரியவில்லை. இதுகுறித்து இந்திய தண்டனை சட்டம் 429-வது பிரிவின் கீழ் மடிவாளா போலீசார் வழக்குபதிவு செய்து, நாய்களை கொன்றவர்கள் குறித்து விசாரித்து வருகிறார்கள். BANGALORE: Residents of Venkatapura and Jakkasandra near Madiwala here woke up on Sunday to the horrific sight of more than 20 dogs, including two pets, lying dead. The dogs were found frothing at the mouth and bleeding from the nose in the morning. Pourakarmikas were seen attempting to load the carcasses into a garbage truck around 7.30 a.m. Alert citizens, alleging that the carcasses were being removed clandestinely, prevented this attempt and called officials of the Bruhat Bangalore Mahanagara Palike and police to the spot. Dogs were found dead in Venkatapura 6th Cross and Jakkasandra 3rd Cross, even as residents found pieces of mutton and chicken allegedly laced with poison in Venkatapura 5th and 3rd Cross. While the residents claimed 27 dogs had been poisoned, the BBMP officials put the figure at 20. “Chicken and mutton pieces were found at eight places…. We used to feel very secure with street dogs around and none of them had caused any harm to the residents here,” K. Narayan, a resident of Venkatapura who first saw pourakarmikas removing the carcasses, told The Hindu. Guruvaya Reddy, a resident of Jakkasandra, said his pet dog ran out of the compound in the morning when he opened the gate to go out for his morning walk. It ate a chicken piece and started frothing at the mouth, he said. Though a veterinarian was called in, the effort went in vain, he added. However, two Jakkasandra residents, Pallavi and M. Raju, were successful in rescuing two street dogs that had started showing symptoms of poisoning. Injections were administered to the dogs and they responded positively. Mr. Narayan said the residents had seen dog catchers of the BBMP in the area about three days ago. Meanwhile, honorary treasurer of Compassion Unlimited Plus Action (CUPA) Sandhya Madappa said this was the second incident in recent months where street dogs had been poisoned. Two months ago, 40 dogs were poisoned in Hennur, she said, and added that they were yet to ascertain why the dogs had been poisoned. Acknowledging that it was the second such incident in the city in recent months, Joint Director (Animal Husbandry) BBMP Ahmed Parvez Piran said that mutton and chicken pieces found in the areas had been sent for tests. Twelve of the dogs found dead on Sunday were sterilised, he said. Post-mortem would be conducted on the dogs, he said, and added that Madiwala police would also investigate the matter. பெரும்பாலானோர்க்கு இந்த ஆண்டு சைவ தீபாவளி தான்!